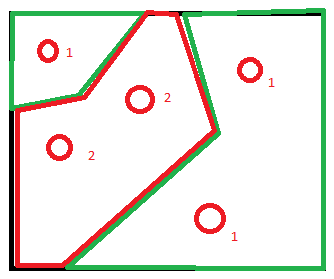 Is there a function in ArcGIS 10.5.1 that can split a polygon (black outline) based on the location of data points (red circles)? I need it to simply make a divide in between different groups of points, which is in this case group 1 and 2 (see image). Not the answer you're looking for? Browse other questions tagged arcgis-desktop arcgis-10.5 toolbox or ask your own question. Getting boundary of raster image as polygon in ArcGIS Desktop? Extracting border between contiguous polygons using ArcGIS for Desktop? Splitting polygon features at specific widths using ArcGIS for Desktop? Setting no-data for area outside of clip polygon with ArcGIS Desktop? Moving Multiple Points Into Single Polygon using ArcGIS Desktop? Making different classes create different size buffers/Thiessen polygons based on point data in ArcGIS ModelBuilder?